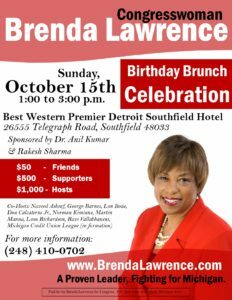 Posted on October 12, 2017 Leave a comment on Don’t miss Rep. Lawrence’s birthday! Municipal Primary Election Day is Tuesday, August 8th! Detroit Slate Cards Available. Saturday, August 5th: 14th District Slate Cards for Detroit Available for Pickup. The District Office is open from 10:00 a.m. to 2:00 p.m. for Detroit Precinct Delegates to pick up their Slate Cards. They list our endorsed candidates, as well as information about how voters can get involved with our Democratic Party. Precinct Delegates should distribute them in their precinct to remind neighbors of the election and at their poll on Tuesday. The 14th District Democrats office at 18409 Livernois Avenue, Detroit 48221. Call Chair Rick Blocker at (248) 217-1637 with questions. Tuesday, August 8th: Primary Election Day in Detroit, Pontiac, Hamtramck municipal elections. Polls are open from 7:00 a.m. to 8:00 p.m. So far in Detroit, the 14th District Democrats have endorsed Heaster Wheeler for Detroit City Clerk, and Brenda Jones and Janee Ayers for Detroit City Council At-Large. Note: There is also a Special Election primary for State Representative District One, which covers a portion of the eastside of Detroit, as well as all of Grosse Pointe Shores, Grosse Pointe Woods and Harper Woods. Saturday, August 12th: Michigan Democratic Party State Central Meeting, held in Traverse City. Due to the State Central meeting conflict, our August District Meeting was shifted to August 19th. Saturday, August 19th: 14th District Democrats August Meeting. Held at Oak Park Community Center, 14300 Oak Park Boulevard, Oak Park 48237. 10:00 a.m. – Executive Committee Meeting Begins. 11:00 a.m. – General Membership Meeting Begins. Call Chair Rick Blocker at (248) 217-1637 with questions. P.S. THANK YOU to everyone who helped make last week’s 14th District Democrats Annual Dinner such a success! It truly was the biggest (and best) political event of the season. 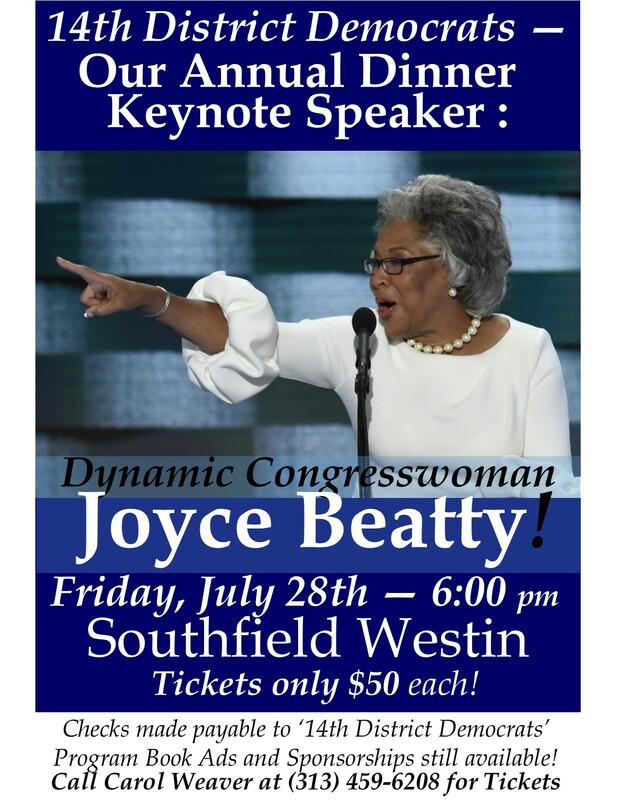 A special thank you to our Keynote Speaker, the dynamic Congresswoman Joyce Beatty of Ohio. As anyone who was there can attest, she brought the house down and gave a stellar address. Posted on August 1, 2017 August 5, 2017 Leave a comment on Municipal Primary Election Day is Tuesday, August 8th! Detroit Slate Cards Available. Posted on July 3, 2017 July 15, 2017 Leave a comment on Next District Meeting: Saturday, August 19th in Oak Park. Veterans Town Hall July 20th in Detroit. Thursday, July 20th, 5:00 to 7:00 p.m. Please join the 14th District Veteran Committee and other veteran service organizations as they provide on-site benefits. Posted on July 1, 2017 July 15, 2017 Leave a comment on Veterans Town Hall July 20th in Detroit. During our meeting we will be planning our Annual Dinner happening on July 28th, which is the main fundraising activity for our local Democratic Party. All interested activists are welcomed and encouraged to join the Fundraising Committee. 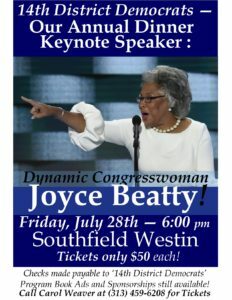 Michigan’s 14th Congressional District includes the communities of Detroit, Farmington Hills, Grosse Pointe, Grosse Pointe Farms, Grosse Pointe Park, Grosse Pointe Shores, Grosse Pointe Woods, Hamtramck, Harper Woods, Keego Harbor, Lathrup Village, Oak Park, Orchard Lake, Pontiac, Royal Oak Township, Southfield, Sylvan Lake and West Bloomfield Township. This is the Democratic Party for that 14th District. 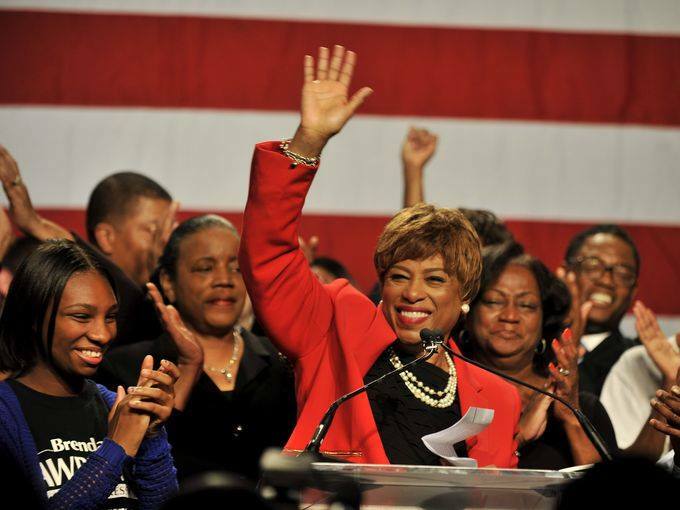 Congresswoman-Elect Brenda Lawrence delivers her victory speech on Election Night, November 2014. Posted on April 14, 2015 July 16, 2015 Leave a comment on Michigan’s Mighty 14th District Democrats!